Zebediah Wells was born with a Congenital Heart Disease. At just 9-years-old he has undergone 19 surgeries, including 2 open heart. He is scheduled for a new open heart and 20th surgery in San Francisco on Friday. Wednesday was a big day for Zebediah. When he stepped out of his Sacramento home, he was greeted by law enforcement officials with the police department, the sheriff's department and the fire department. Zebediah isn't in trouble, but he did get a proper send off before a big trip to San Francisco. The nine year old was born with congenital heart disease, and soon he will have his third open-heart surgery. His mother says the open surgery will include fixing his pulmonary valve, moving his pulmonary artery in front of his aorta and adding a pacemaker. Zebediah is a big fan of law enforcement, and has emblems representing them all over his protective helmet. 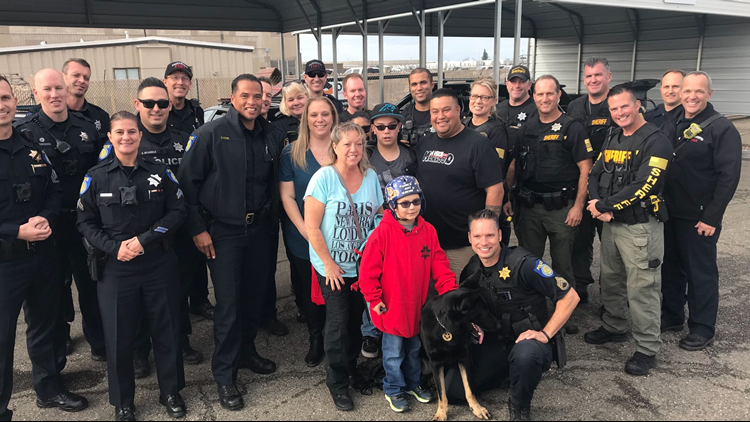 That's why Sacramento firefighters, police and deputies decided to surprise him with a trip to the training facility - and a meet and greet with a K9 officer. Once the motorcade made it to the Northern California Regional Public Safety Training facility, Wells got a chance to help train a canine, squirt some high-pressure water hose and had a Sacramento Police helicopter flyover and land in his honor. The shy 9-year-old was all smiles by the end of the day. His mom, Cherish Wells, told ABC10 they will always remember this unforgettable experience. 9-year-old Zebediah got a rare look inside a Sacramento training facility Wednesday. It was the City's way of sending him to open-heart surgery with a smile. Zebediah was later given a badge star sticker and sworn in as a mini cadet. He promised to always listen to his parents and do his homework. Finally, he got to meet Sacramento Police Chief Daniel Hahn. Zebediah was scheduled for his 20th surgery on Friday, Dec. 7, but on Wednesday doctors notified his mom that the surgery has been postponed to Wednesday, Dec. 26.